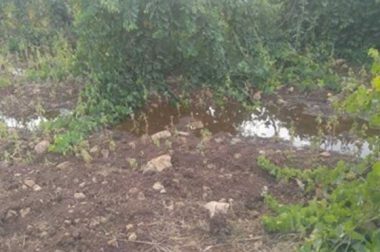 Israeli settlers, Tuesday, dumped wastewater into an agricultural land belonging to a Palestinian family in the town of Beit Ummar, to the north of the southern West Bank city of Hebron, said a local official. Yousef Abu Maria, an anti-settlement activist in the town, told WAFA that settlers from the nearby illegal Israeli settlement of Gush Etzion dumped waste water into an agricultural land planted with grapes, to the north of the town, in an attempt to force the Palestinians to abandon their land as a prelude to seize it for the benefit of settlement expansion. He maintained that, at this time of year, farmers in areas adjacent to the illegal settlements established to the north of Hebron suffer from settler violations and attacks against them, which inflicts heavy losses.